Don’t waste that charcoal! When you’re grilling dinner this summer, take advantage of the hot grate and throw on some fresh fruit for a delicious, healthy dessert! In a small bowl, whisk together the yogurt, honey and zest. Place in the refrigerator until ready to use. Using your hands, rub each half of your peach with a small amount of vegetable oil to keep it from sticking to the grill grate. Place on the hot grill face up for 3 minutes to heat the peaches through, flip over and grill until the peaches are caramelized and softened. 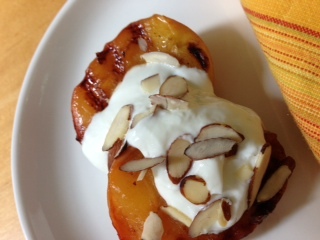 Place peaches on serving plates, dollop with yogurt and sprinkle with nuts…YUM! Love this!I do the same thing with sour cream and stevia! Thanks for sharing!